Logistics and Transport notes - Please send corrections and contributions. 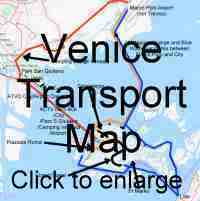 May 2018 BEFORE setting out to Venice - Consider buying online, one or more Venezia Unica transport cards. - If you want, there are versions which include entrance to attractions. 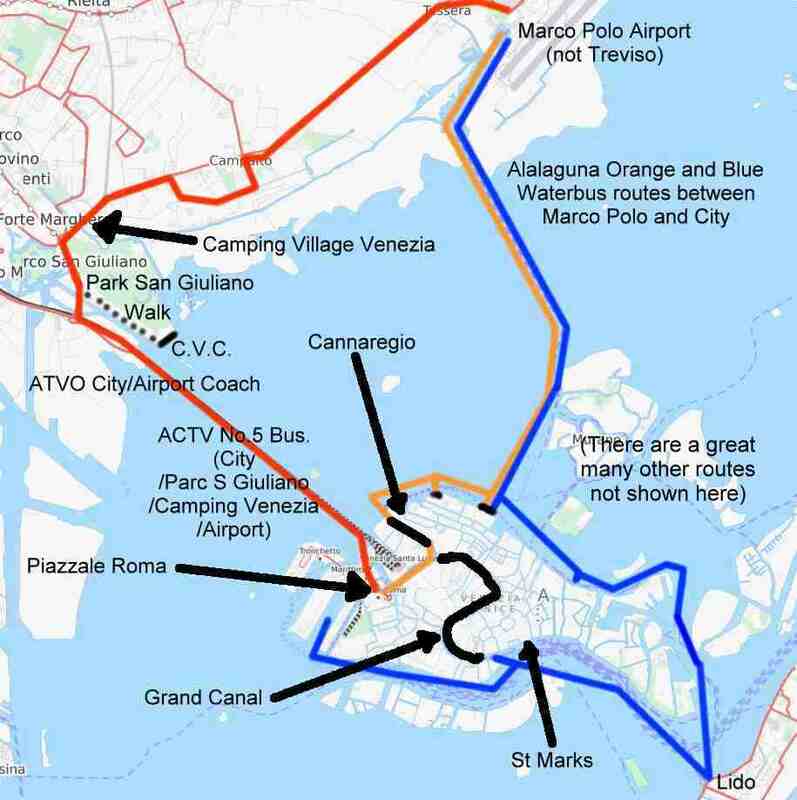 This Guide to Venice Transport is a perspective (American) on how to get more out of longer stays. Over the next few days - Work at "The Yard" to ensure Molly is in tip-top condition. (a) Transport from airport to city on arrival, ONE WAY assuming you'll return to the airport from Mestre not the City). Probably best to buy in advance, (a), (b), (f). Th/Fr/Sa (b) Waterbuses and entrances to attractions (Get a 1, 2 or 3-day card?) Probably best to buy in advance, (a), (b), (f). (c) Bus from City to CVC at Mestre (See map). Launch Molly - Prepare for Vogalonga. Row from CVC Mestre to a mooring in the City. (c), (d), (e), (g), (h) - Probably best to buy in bulk at the ticket office in Piazzale Roma. 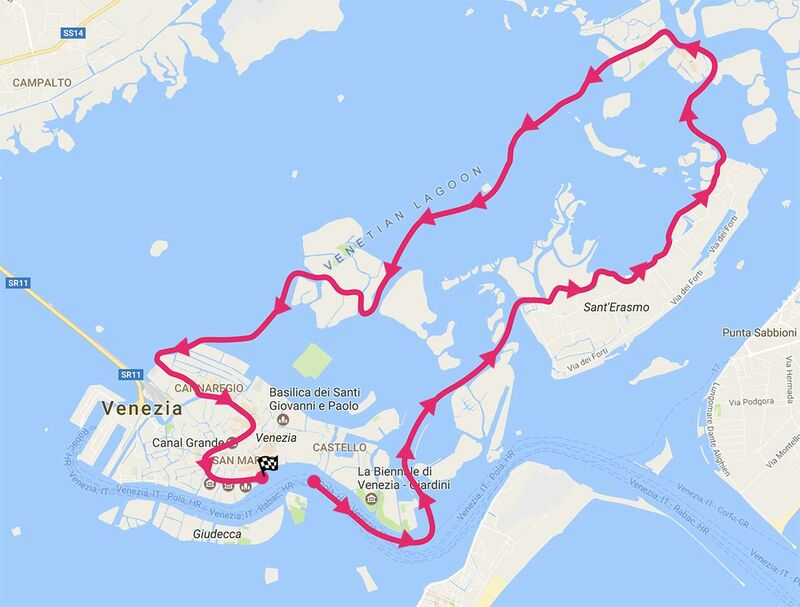 The epic 30km processional row of maybe 2,000 human-powered boats around the Venetian lagoon. 9am. from Saint Marks, ending at The Grand Canal. - Their website . Map of the Route. After Vogalonga, row to CVC, Mestre. (d) Bus from CVC Mestre to City. (click to enlarge) - (Courtesy of pluplumcreations, Venice). (c), (d), (e), (g), (h) - Probably best to buy in bulk at the ticket office in Piazzale Roma..
(e) Bus to Mestre and back. - Prepare Molly in sailing mode for tomorrow. 12:00 - 18:00 Raid boats arrive at CVC, register, etc. 19:00 Welcome Dinner at CVC. (g) Bus from City to CVC Mestre early on Tuesday morning. Vacate city accomm. "Vela Raid" - Their website . Their schedule, etc. About 30 sail and oar boats enjoy a mildly competitive grand exploration of the lagoon, including corners well off the tourist trail. Starts and ends at CCV, Mestre. Sat 26th Afternoon - Occupy accommodation at "Camping Venezia", Mestre. Velalonga (Long sail) - Their website . Map of the Course . 200 sailing boats race 10 miles around the lagoon in waters nearer to the city. Followed by prizegiving dinner at CVC Mestre. Head home today and tomorrow. (h) Bus from Camping Venezia at Mestre to Airport. Our Venice 2008 pre-departure info (probably outdated). Have you got any contributions from 2016, or for this year? - Please send text, pictures or links.